More than 6,500 women in the UK are diagnosed with ovarian cancer each year. Ovarian cancer is the 5th most common cancer in women, after breast, bowel, lung and womb cancer. Any screening method tests asymptomatic women to find cancer early, when the chance of cure is highest. At the moment, there is no accurate and reliable screening test for ovarian cancer in the general population. Clinical trials are looking into the role of ultrasound in combination with CA125 testing, a blood test for a protein that may be raised in ovarian cancer. If you have very close relatives who have had ovarian cancer or breast cancer you may be more at risk of developing ovarian cancer than other women in the population. A very close relative means a mother, sister or daughter. It is currently not available on the NHS for low risk women. 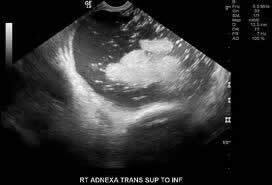 Ultrasound is a non invasive method of screening and has been used in combination with CA125 for screening. Annual ultrasound examinations of the ovaries are recommended for women at high risk of ovarian cancer.